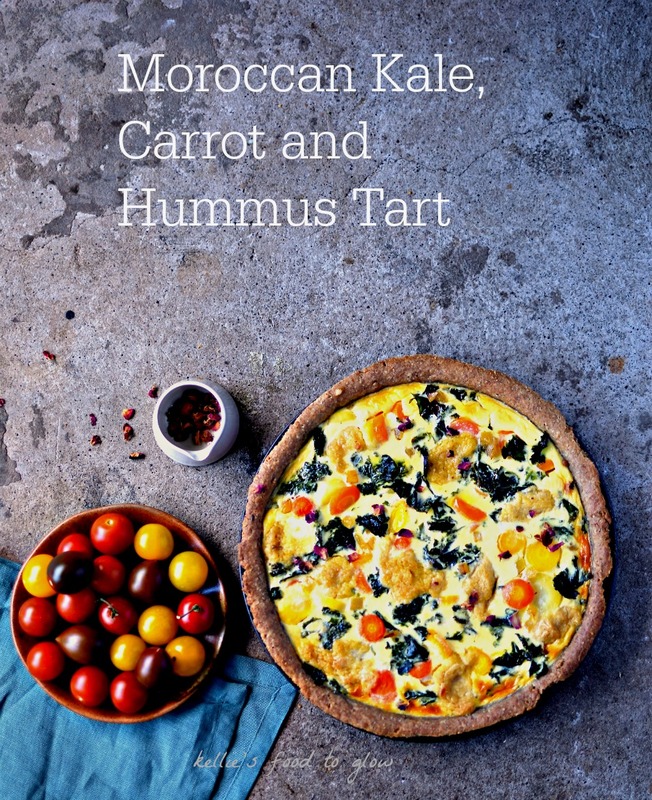 Using a combination of quality fresh, store cupboard and frozen ingredients this colourful kale, rainbow carrot and hummus tart is my idea of comfort food heaven. While it isn’t quite a quick meal, it is incredibly easy. You can make it quicker by using bought shortcrust dough, but my very easy olive oil dough, brushed with (optional) preserved lemon oil as it comes out of the oven, lifts this tart out of the ordinary. Serve with fresh salad leaves, juicy cherry tomatoes, and something like my Moroccan Carrot Salad for a colourful and nutritious lunch or dinner. For this recipe I used frozen chopped kale, frozen sliced rainbow carrots, and frozen bulgur wheat mix with loads of tasty goodies – courgette, red pepper, chickpeas, sultanas and a lemon-mint dressing. My recipe is completely adaptable to using all fresh ingredients, but I think this is a great way to use a little of what you need and not worry about waste. Feel free to use fresh veg instead of frozen, but frozen vegetables and grain mixes make spontaneous cooking a snap. Just open your freezer and use what you need! No compromising on nutrition and taste either. 1. For instructions on making up the olive oil dough, follow the instructions on my post, Tandoori Cauliflower Tart, roll out to 3 mm thick, and don’t trim the uncooked dough. Whether using homemade dough or prepared dough, prick the bottom lightly with a fork and blind bake on a preheated baking tray in a 200C oven. Trim the excess crust. Turn the oven down to 180C for the remaining portion of the recipe. 2. Microwave (for three minutes) or stir fry in a little oil (for four minutes) the bulgur wheat mix. Let steam/cool. 3. Microwave (4 minutes) or steam (five minutes) the kale and carrots. Let steam/cool. 4. While the vegetables are cooking, whisk the eggs and creme fraiche in a large jug, adding 2 tsp of the preserved lemon plus 1 tbsp of preserved lemon oil – if using. Otherwise add lemon zest. 5. Sprinkle the bulgur wheat mix over the baked crust, then evenly distribute the carrots and kale. If the pie tin isn’t already on the tray put it on now and slide it into the oven. Pull out the oven shelf a little and carefully pour over the creme fraiche-egg mixture into the tin; dot on the hummus . Bake in the oven for 20-25 minutes, or until the middle is no longer wobbly. 6. When the tart comes out of the oven, brush with preserved lemon oil – if you used preserved lemon that is. Allow to cool for 20 minutes before garnishing with the remaining preserved lemon, sprinkling with rose petals, cutting and serving. Enjoy! * for those not near an Iceland or are living outside the UK, use any rehydrated Moroccan-seasoned dried bulgur wheat or couscous mix OR use your own cooked grains and a pinch of cumin, ground coriander, salt and dried mint OR 1 tsp ras-el-hanout. This is an interesting recipe for me: 1) because I rarely make tarts and pies; 2) I rarely base meals around bought frozen ingredients. But, I do rely on my freezer(s!). A lot. I have three fridge-freezers (two are in the garage) and mainly make use of the freezer part. During the summer I pick and hoard fresh Scottish berries, but I also blanch wild garlic leaves and fresh, seasonal vegetables that I buy in quantity; freeze bulk batches of sauces, mixes, cooked grains and pulses of many kinds; fill ice cube trays with leftover sauces, wine, minced herbs, garlic, ginger and the like. And of course it is repository for “a little bit of this and a little bit of that”. I’m sure you are the same. In short, despite not basing meals around frozen foods I actually use a lot of frozen foods – now that I think about it. So, I was intrigued and pleased to be asked by Iceland to be part of their #PowerofFrozen campaign where bloggers like me show our readers how eating frozen can be not only inexpensive, convenient, and good for a no-waste lifestyle, but also delicious, very nutritious and of high quality. I have to confess that Iceland is a store that I have rarely been in, wrongly associating it with puff-pastry based party foods, seafood rings and ready meals. So, it was with much surprise that when I visited three of their Edinburgh stores I saw not one little deep freeze of vegetables, but at least three big ones – stuffed with the usual green beans, onions, broccoli, peas, corn etc, but also huge bags of Kale, Rainbow Carrots, Peppers, Asparagus, and several grain and bean mixes. I have tried the Zesty Bean Quinoa mix and the Bulgur Wheat mix (there is also a Couscous one), and both are excellent, with interesting, natural ingredients. I used the quinoa mix to make quesadillas (they sell fresh grated cheese and tortillas, too) and added it to a plain vegetable soup. I can see these grain packs being very useful to add a bit of oomph to things I am already making – and brilliant as you use just what you want and store the rest for another time. As for the giant bag of kale, green smoothies can be made with little if any forward planning and again, no waste. My nearest store was closing on Saturday for a big refit so I can’t wait to get back and see what they’ve done – and what vegetables they’ve added. I really applaud the launch of the #PowerofFrozen campaign as it has made me re-evaluate what I think I think I know about Iceland. If you want to read more about the campaign, do go to their website. For example, I was pleased to read that they were the first UK supermarket to remove artificial colours, flavourings, non-essential preservatives and MSG from their own brand ranges. In 1986. Just thinking about the future of this campaign, I would like to see Iceland expand their “Superfoods” range (they can ask me for advice – ha ha), add other “new staples” like plain diced butternut squash and wholegrain rice, as well as offer some organic foods too. All of those foods are just as good when cooked from frozen as they are from fresh. These steps would put Iceland firmly on my weekly shopping route. My latest recipe on Huffington Post – it made the front page! This is a commissioned post for Iceland. I was paid to create a recipe using a couple of their products of my choice. Thoughts and opinions are very much my own. I love the dough recipe. Especially, the idea of using seeds in it. I bet, it gives extra flavor to the tart. I don’t live in the UK. What would be in the bulgur mix or what could I substitute for it? Is there something that I can use instead of the bulgur mix? We don’t have that store here in North America! I love the colour combinations here! Looks really appetising! I like your idea to use all frozen ingredients. I’ve started to see frozen chickpeas in our stores which I love the idea of since it avoids the use of tins and probably saves a little on individual packaging. Really love the looks of this tart – especially the olive oil crust and the brush of lemon oil at the end. And even though I don’t make tarts much either, I always think I should make them more when I am enjoying them. Talk about ‘eating a rainbow’ this is lovely and colourful & I bet very flavoursome too. Congratulations on the front page of the Huff Post too, fantastic news! This tart looks so delicious and colourful too I would love to have slice for lunch. This is by far one of the most visually appealing meal I have come across in a while, yum, can’t wait to experiment with it. Thank you. I can’t believe I’ve never thought of using hummus in a tart! What a brilliant idea. I bet it would be nice spread in a layer on top of the pastry as well, before you add the eggs. Must try. Ooooh I saw this gorgeous tart in your instagram feed and I’ve been waiting for the recipe 🙂 Good to see somebody support frozen food as all too often people lump it together with evil “processed” food – when it’s not! I promote frozen at work too. Quite a number of the cancer patients that I see don’t have much of an appetite and have difficulties cutting hard or tricky foods safely because of chemo-induced nerve damage, so frozen foods help with not only with food waste but getting people to be able to eat foods that they may otherwise find difficult to prepare. Man, Ohh man I could do with couple of slices of this for lunch today. Yes Iceland have an impressive range which I have only found out about recently. Quite a revelation, isn’t it? This sounds wonderful, I like the crust you made for this as well. Had exactly the same preconceptions of Iceland as you Kellie but not against frozen food. I’m going to make my own burghul mix for the freezer and pop into the store for a good look round when next in uk. Yumm. I love anything with Ras el-hanout. I just recently made my own blend for a Tagine and will definitely use it for this recipe. That would be absolutely perfect, Eileen!